Khotia – Huayna Potosi . 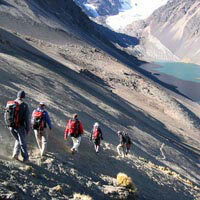 :Bolivian Mountain Guides:. Day 1.- LA PAZ – LAGUNA KHOTIA – LAGUNA AJUANI. Departure from La Paz on a vehicle to Lake Khotia (4570 m.a.s.l). 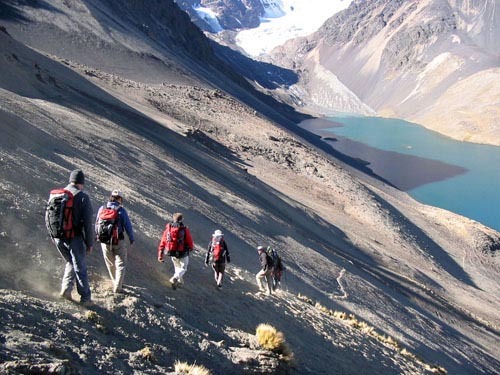 We start slowly the hike toward the Andean slopes. Later, Lake Titicaca could be seen at the left. The path leads zigzag-fashion down to arrive at Ajuani lagoon. The path is winding but appealing until we arrive at Sistaña lagoon, where we take a lunch break. In this point, the path starts ascending toward the summit. We arrive at Jurikhota lagoon, beautiful and isolated, surrounded by snowcapped mountains. Day 4.- PASO JISTAÑA – BASE DE MARIA LLOCO. Day 5.- PASO MILLUNI – HUAYNA POTOSI – RETORNO A LA PAZ.